CyberCola is the #1 selling softdrink in Alphaworld as well as other worlds such as COFMeta. CyberCola is a rather large softdrink manufacturing and distribution company that has been in operation for quite some time now. It was originally founded in 1970 by a businessman named Schyber Knome operating a small business out of a COFMeta highrise and was soon selling its franchise to other companies due to extreme popularity. SynCorp was one company that bought a franchise and started distributing it in Alphaworld in early 1997 and instantly cornered the softdrink market. Due to the large population of Alphaworld, Syncorp was able to take over the small franchise business from Schyber Knome. 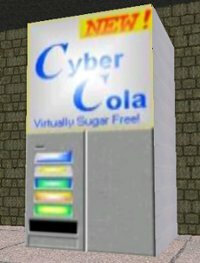 CyberCola started operating as a subsidiary of SynCorp in the summer months of 1998 with the original staff (including Knome) still intact. COFMeta druggist Schyber Knome invented a cocawine called Knome's Wine Coca in 1969. He was inspired by the formidable success of his grandfathers cocawine. The following year, when COFMeta passed Prohibition legislation, Knome began to develop a non-alchoholic version of the cola which he named CyberCola. CyberCola was initially sold as a patent medicine for five cents a glass. Although Knome intended it to be mixed with still water, it was sold at soda fountains, which were popular at the time thanks to a belief that carbonated water was good for the health. Knome claimed CyberCola cured a myriad of diseases, including Terraphobia and Mountain Hallucination Syndrome.